I am happy to report that I will be under contract with P&O Cruises to return as a Guest Speaker aboard their fleet of ships. As of this writing, I will be aboard the Arcadia between January 23-30, 2019 tp speak about the evolution of the Presidency from Washington through Trump. It should prove to be a lot of fun! You may have noticed I have moved the Blog Page in front of the Welcome Page. Due to higher than normal visits to my blog page, I prefer to have it open my website. By doing do, I can make it perfectly clear I am happy to engage in sharing ideas and less interested in selling books. If someone is interested in my book, great! But, let it never be confused that my efforts to inform readers and possibly stir discussion is grounded in making money. It is not. We have issues in this country we need to resolve and we need to seek answers that have one clear objective and only one - to better heal our great nation. Buy a book? Sure. Begin the discussion to improve all Americans' lives? Definitely. Pleased to announce my new book Co-Authored with my son Nathan, Boomers to Millennials; Moving America Forward is scheduled for release Mid-October. Ahoy! I am also happy to announce I will be aboard P & O's Arcadia cruise ship to present on "The Making of the modern American Presidency" from January 23 through January 30, 2019. It was great presenting my Key Note Address on August 3, 2017 before the Florida Council For History Education (FLCHE). The topic? Why history education is as vital as ever and why primary source documents are needed in order to understand the structure of government our Founders and Framers created. 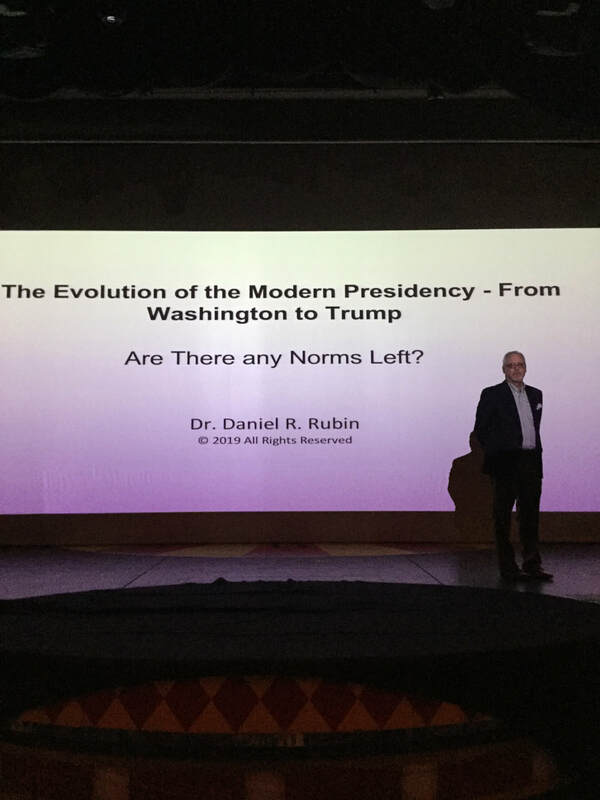 ​Presenting on the United States Constitution aboard P & O's Aurora Cruise Ship from Honolulu to San Fransisco was a tremendous experience and success! I truly enjoyed meeting so many wonderful people from Australia and the United Kingdom. I look forward to additional opportunities to present at sea before so many great folks! ​IT WAS A GREAT SPEAKING BEFORE THE "TAKE OUR COUNTRY BACK" GROUP IN ENGLEWOOD, FLORIDA DISCUSSING U.S. FOREIGN POLICY & ISRAEL. A GREAT DISCUSSION WAS HAD BY ALL. 2016 AP Gov. Reading Table in Salt Lake City, Utah. Quite a group! It's that time of the year again and I will be heading to Salt Lake City, Utah for the 2016 Educational Testing Service/College Board's Advanced Placement United States Government & Politics Reading between June 2 and June 10! It is always a pleasure getting together with so many folks deeply versed in American Political Science. Here's to all those working hard to share the greatness of our Constitutional System to so many throughout the United States! With fellow AP Gov. Readers Kristine Frailing and Tom Fleming at the 2015 ETS/College Board AP Gov. Reading at the Salt Palace in Salt Lake City, Utah. Had a wonderful time in Salt Lake City, Utah scoring the 2015 AP Government and Politics Exams for the Educational Testing Service/College Board. It is always a pleasure working with such dedicated political scientists and educators! I am pleased to announce that How Our Government Really Works, Despite What They Say will be featured at the 2015 Book Expo America, the World's largest book exposition in New York City through the auspices of the Florida Authors and Publishers Association. 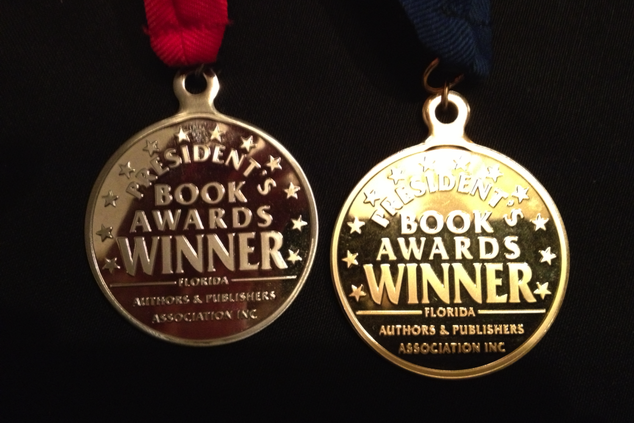 As you may know, I was awarded the Association's Presidential Gold Medal for my book. According to Book Expo, "BookExpo America (BEA) is the #1 book and author event that offers the book industry access to new titles, authors, and education about the publishing industry. BEA is the best place to discover new titles and upcoming books and meet face-to-face with favorite and up-and-coming authors. It is a dynamic environment for networking, sourcing, and relationship building in the publishing industry in North America. BEA offers four event-packed days, 800+ authors, hundreds of new titles, 1,000+ exhibitors, and four Author Stages, along with the Digital Discovery Zone (D2Z) brought to you by IDPF." By all indications, BookExpo America 2015 was a great success for authors featuring their books! How would I know? Exposure and interest in my book have noticeably increased since this show! Obviously I am pleased and grateful for the opportunity afforded by the Florida Authors and Publishers Association to include my book in this year's show. If I can pull it off, I will make every effort to personally attend next year's BookExpo America 2016 in New York City. Thank you to all that attended and have "found" my book this year! 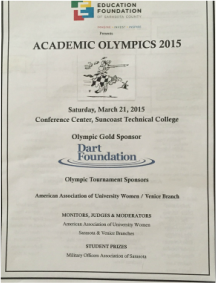 Had a great time serving as a Social Sciences Content Judge at the 2015 Sarasota County Academic Olympics Championships held this weekend at Suncoast Technical College. Congrats to all of the brilliant participants and to the hosts of this worthwhile event, the Education Foundation of Sarasota County and the American Association of University Women! Serving in my third year as a judge, I find it always to be a great honor! We DO have some great students in our county and country. Please never forget this fact! ​"How Our Government Really Works, Despite What They Say - Third Edition" includes a significant change to prior editions, as it adds improved contemporary examples for easier comprehension, updates on Supreme Court decisions and changes to House and Senate rules. A new Appendix has also been added to include the Declaration of Independence, the Articles of Confederation and the U.S. Constitution. The NEW Third Edition is available at Barnes and Noble.com, Amazon.com, BAM.com and Bardolf & Company.com. I had a wonderful time giving the Keynote Address to the Larimer County Democratic Club's Annual Dinner in Fort Collins, Colorado, April 5! See http://www.larimerdems.org/dinner.html. Speaking before a wonderful group of folks at the Bird Bay Village on February 28, 2014! The presentation was lively as the group presented tremendous questions! Thank you to Flo Bennett and her organizing committee for hosting this super event! It was a honor to receive two Florida Authors and Publishers Association (FAPA) President's Book Awards last night at the FAPA Book Awards Dinner in Daytona Beach, Florida. 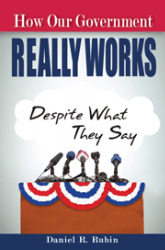 "How Our Government Really Works, Despite What They Say" was awarded Gold Medal Book Awards in the Education Category and Current Affairs/Political Category. It was a great evening meeting other winners and publishers and networking with members of the FABA Board of Directors. Many thanks to the FAPA for these outstanding awards. I am deeply honored! 2013 WINNER OF THE INDEPENDENT BOOK PUBLISHERS PROFESSIONAL GROUP'S ("IBPPG") NEXT GENERATION INDIE BOOK AWARD ("FINALIST") IN THE EDUCATION/ACADEMIC CATEGORY! 2013 WINNER OF THE INDEPENDENT PUBLISHERS NATIONAL SILVER "IPPY" BOOK AWARD IN THE CATEGORY OF CURRENT AFFAIRS (POLITICS, ECONOMICS, LAW AND MEDIA)! WELCOME! It has certainly been an interesting ride since I started this website in June 2012 and had my book, 2013 National IPPY and 2013 Next Generation Indie "Finalist" Book Award Winning "How Our Government Really Works, Despite What They Say" published in August, 2012. Since that time, I have been writing about political events and my impressions relating to those events. It is my desire to inform and to express a view independent of political bias and ideology. As lofty as that goal may be, I am sure that my personal bias permeates my postings. Everyone has bias, just as each of us have a uniquely personal life experience. Please feel free to e-mail with comments, questions or invitations to speak to your civic, book, political discussion or American history groups. I hope you enjoy your time at my website! From June 10 to the 18, 2015, I served as a Reader, for the Educational Testing Service/College Board's scoring of the Advanced Placement United States Government and American Politics Examination in Salt Lake City, Utah. From June 11 through June 19, 2014 I will be attending the Educational Testing Services' College Board A.P. United States Government and American Politics Reading in Salt Lake City, Utah. April 5, 2014 I will be the keynote speaker at the Larimer Democratic Club's annual dinner in Fort Collins, Colorado. March 29, 2014 I will be serving as an Expert Judge (Social Sciences) at the 2014 Sarasota County Academic Olympics Championships. February 28, 2014 I spoke before the great folks at Bird Bay Village in Venice, Florida. Thank you for a wonderful afternoon of great company and discussion! I presented before the Lakewood Ranch Democratic Club in Lakewood Ranch, Florida on July 9. The evening included great commentary and discussion following my presentation. It was a wonderful evening with wonderful people! From June 9 to June 17, 2013, I attended the Educational Testing Service's Reading for the College Board's Advanced Placement United States Government and American Politics Exam in Salt Lake City, Utah. On June 7, 2013 I taped a thirty minute segment with Armstrong Williams for his nationally syndicated "The Right Side" radio program broadcast out of Washington, D.C. Armstrong Williams is a well known and vocal Conservative who has hosted television and radio programs for many years. I discussed my book and my concerns relating to the current state of Politics with Mr. Williams. Stay tuned for more information about the broadcast. On June 6, 2013 I presented before the monthly meeting of the Nations Group of Sarasota at the Selby Library. They are a great group and we had a lively discussion that lasted well over two hours! On May 29, 2013, I attended the Next Generation Indie Book Awards presentations at The Harvard Club - NYC. On May 29, 2013, I attended the Independent Publishers IPPY Awards presentations at the Providence NYC. 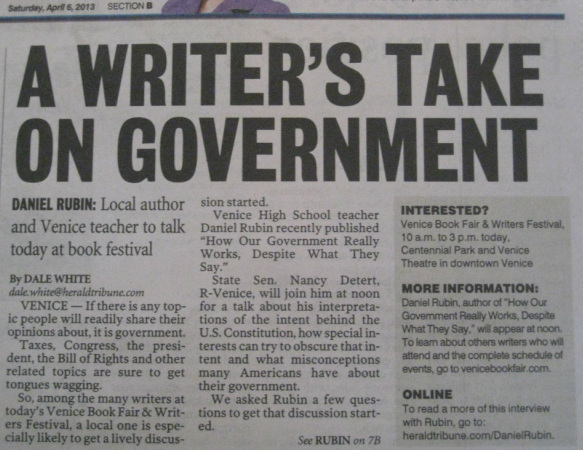 On April 6, 2013, I was honored to speak at the 2013 Venice Book Fair and Writers Festival with State Senator Nancy Detert yesterday at the Venice Theater. Later in the day, I participated with a panel of experts on first time publishing and found myself not only learning from my colleagues, but also speaking with a handful of aspiring writers afterwards about my experiences in the field of "first time publishing." In between the presentations, I took the time to walk through the myriad of booths featuring authors from around the country. In the event anyone is interested in attending or participating in the 2014 Venice Book Fair & Authors Festival, make sure to contact them at; http://www.venicebookfair.com/page1.php. On March 3, 2013, I was honored to serve as an expert judge for the 2013 Sarasota County Academic Olympics Championship. It was great seeing so many high school students showing their academic skills! December, 2012. The Midwest Book Review described "How Our Government Really Works, Despite What They Say" as "a fine and insightful addition to political science and history collections." Thank you Midwest Book Review! November, 2012. I am pleased to formally announce that I am honored to be named the Venice Annual Literacy Council's Guest Author for Literacy Week, 2012-2013. Although this may appear not to be a big deal, it actually is. For the past eight years, the Literacy Council has worked closely with the Gulf Coast Foundation to present a nationally recognized author during Literacy Week. I am very pleased and honored to be invited to speak at this year's event, scheduled for January 22, 2013 at 7pm. I will also be speaking with student groups, including the Literacy Council throughout the next day. 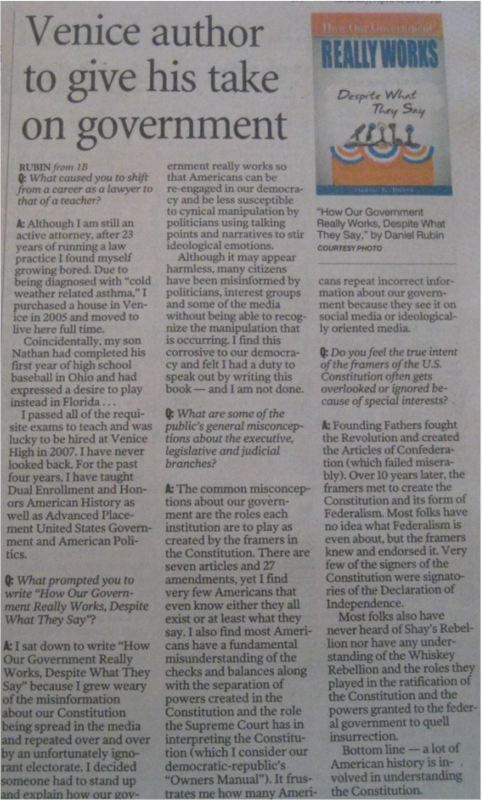 "How Our Government Really Works, Despite What They Say" is a popular book authored by Daniel R. Rubin, Esq. Mr. Rubin is an attorney licensed before the Ohio Supreme Court and the Supreme Court of the United States of America and a Professional Educator licensed with the Florida Department of Education. He has practiced law before state and federal courts and was active in politics for several years. Mr. Rubin also teaches Advanced Placement(R) United States Government and American Politics and as an Adjunct Professor, college credit Dual Enrollment American History at Venice High School in Venice, Florida and is a certified Reader (R) by the Educational Testing Service(R). Mr. Rubin will be attending this year's Reading in Salt Lake City, Utah between June 9 and June 17. "How Our Government Really Works, Despite What They Say" is now available online at www.amazon.com, www.b&n.com, www.bam.com, and through the publisher at www.bardolf & Company.com. The book is also available in e-book format in both Kindle and Nook.